The designs have changed again... it's no longer only 6 stories but 8. It's a Hampton Inn. Sorta gross regardless. It's a Hampton Inn, can't expect too much. Glad it got upped to 8 stories and that that corner will be filled and longer be a parking lot. It also has a retail (most likely a restaurant) which is great for the area. I'd like to see a more upscale hotel elsewhere in downtown though, something like a St. Regis or Intercontinental. It's a limited service, low budget chain. The construction costs have to be kept low. We are in a real catch 22 downtown. We continually loose major conventions due to the lack of hotel rooms. However transient (corporate) demand is not there yet to support another large hotel. Because the city council, and Mayor, keep promoting North First and not downtown to gain major businesses this will continue to be a problem. We need at least one more MAJOR downtown business anchor, like Adobe. Samsung would have been perfect! Until then, this is all we can hope for. After Josh I'm perhapst the biggest fan of downtown San Jose there is. That said, I think SJ pols and planners should now focus all major corporate/tech development at N1/NSJ. As has been stated before, our current downtown (The Historic Core) should now be viewed as our entertainment, cultural center with sports, performing arts/shows, restaurants, urban residential and unique retail ala San Pedro Square Market. Downtown (as anon alluded to) could still serve professional services and smaller tech companies/start ups, but N1 should be our focus for major corporate/tech development. Just my opinion. 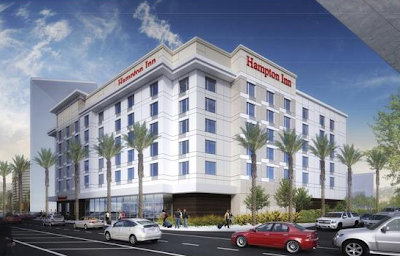 This Hampton Inn is nice in-fill, but we need more upmarket select service hotels in DTSJ. I'd love to see a Hotel Indigo, Andaz or now that Marriott has announced it, AC Hotel.